Here is a clever way to dress up your terracotta flowerpots that may be looking a bit worn. 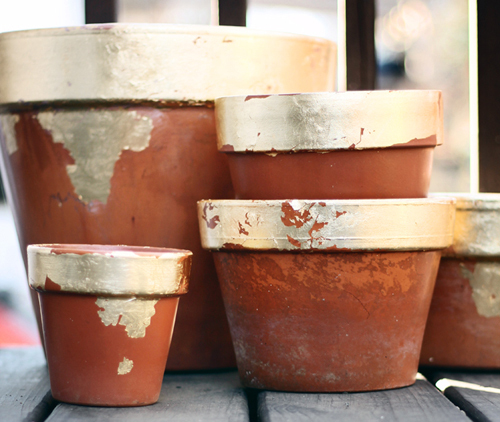 You can use old or new pots, either way the gold leaf will dress them up and give them a cohesive look. We thank huntedinterior.com for this clever idea. Gold or Silver leaf - available in sheets at most craft stores. Size - the glue to adhere the leaf to. Spray sealer for the leaf. Normally they recommend following the instructions when applying the leaf to items but in this case, because the flower pots are so porous, the size dried immediately. So they recommend you apply a length of glue and immediately apply the leaf. Don't wait. It will dry immediately. Continue around the entire edge of the clay pot until you are complete. Just try not to brush the glue over the existing leaf as it will dull the shine. Once all the pots are gilded, coat them in a spray sealer. If you want to retain some of the natural patina that accumulates on the worn pottery, avoid spraying the sealer there. We think these gilded flowerpots would be perfect for a holiday table, a wedding display, or a New Years Party. Simply elegant! Give it a go and let us know how you do? Read more..... Growing Chili Peppers in garden pottery.